Northwestern Medicine Valley West Hospital is a short-term, critical access community hospital in Sandwich, Illinois that has served the DeKalb County community for over 70 years. More than 150 physicians on the voluntary, community-based medical staff and the emergency department at Northwestern Medicine Valley West Hospital provides 24-hour access to board-certified emergency medicine physicians. As part of the Northwestern Medicine network, patients at Northwestern Medicine Valley West Hospital have access to the resources and advantages of world-class care and leading-edge clinical trials at locations across the region. Visits from family and friends can bring patients the warmth, comfort, encouragement and support they need to heal. Northwestern Medicine encourages you to spend time with your loved ones and friends during their hospital stay. 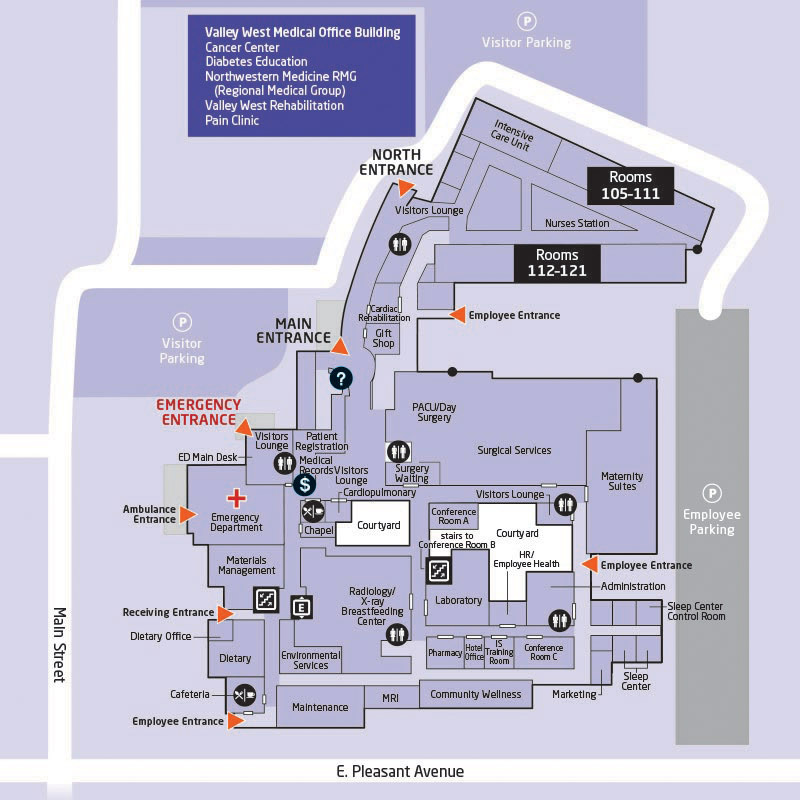 Northwestern Medicine Valley West Hospital offers a wide range of information, resources and amenities to help make your experience convenient, comfortable and efficient. Download our Services and Amenities Map. Phone orders for delivery to patients are welcome by calling during gift shop hours, call 815.786.8484 ext. 253230. Northwestern Medicine Valley West Hospital Auxiliary offers college scholarships to students pursuing a degree or certification in a healthcare-related field, such as nursing, applied health or pharmacy. Please click here for more information and to download an application. A nondenominational chapel is located on the first floor of Outpatient Services and is open 24 hours a day, seven days a week. Chapel is located around the corner from the Main Lobby.